The Mirage 2 tent is the lightest double-walled shelter in the entire Black Diamond tent line. And it isn't just light, either. The Mirage is also one of the strongest two-person, three-season tents out there. Period. Whether you're high in the Alps, deep in the woods, sitting pretty on the beach, or surviving the desert, the Black Diamond Mirage tent will get you through with flying colors. Black Diamond has successfully created a line of single-, two-, and three-person tents and shelters that not only live up to industry standards and beyond, but also stand the test of time. While not all of their tents are the best of the best, you can rest assured that a Black Diamond shelter is well-made, durable, comfortable, and easy to use. The Black Diamond Mirage tent certainly owns each of those qualities. But whether or not it's right for you is another question entirely. Everyone has different needs and requirements when it comes to a camping shelter. And that's where Camping Tent Reviews.com comes in. We will help you narrow your tent buying decision down with fair, honest and accurate reviewsso that you can buy the best tent for you. This tent is as durable as they come and only weighs 3 lbs 15 oz. This means that you can take it with you wherever you want to go, and not have to worry about it dragging you down. Flawless Fly - The Mirage's will keep out the very worst weather. Easy Assembly - Put it up, take it down, and still have time to have fun on your trip. Spacious - Both the interior and vestibule are comfortably large. Are there drawbacks to choosing this Black Diamond tent over another? Sure, there always are. The Black Diamond Mirage 2 tent is designed in such a way that it's hard to get in and out of the shelter when it's raining without getting the interior wet. Other campers were having some trouble keeping the tent level on the ground. 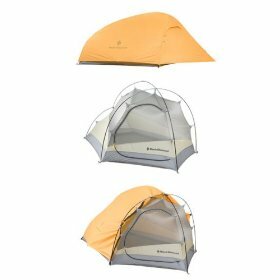 Mostly, people say that the tent is really great, but for the price ($299.95 on Backcountry.com) it should be better constructed. Below, we here at Camping Tent Reviews will take a closer look at these pros and cons and see just how heavily they weigh against each other. Vestibule Area: 10 sq ft. The greatest advantage of the Black Diamond Mirage tent is also the most widely publicized: its size and weight. At just under 4 pounds, this is by far the lightest double-walled tent of all Black Diamond shelters. You can take it car camping if you'd like, but don't be too intimidated to take it backpacking; this 2 man ultralight backpacking tent won't weigh you down. The Mirage's fly is also one of the company's best. Stake down the fly and prepare for a quiet, still night, no matter how wildly the weather is raging on the outside. One report even has the Mirage 2 tent standing firm (and dry) against the likes of Hurricane Ike . Like the Black Diamond Mesa, the Mirage 2 tent can be set up and taken down in a relative heartbeat. The hub-wrapped and variable-diameter pole system is a piece of cake to erect and dismantle. Also, as far as two-person backpacking tents go, the Black Diamond Mirage tent is surprisingly spacious and comfortable. There is no problem fitting two people into this light-yet-heavy-duty shelter. While the tent is, by most accounts, a top rated backpacking tent, many consumers wish they had gotten a little more bang for their buck. For nearly $300 (Amazon.com) , there shouldn't be as many flaws as there unfortunately are. For one, if you're caught in a rainstorm, don't be too hasty to move in and out of your tent. With the door open, the angle of the tent makes it nearly impossible for the interior to stay dry while its pouring. Another problem that was fairly widespread among the online tenting community is that the tent itself doesn't sit exactly level, and no amount of staking helps. When there are two people and plenty of gear inside, the problem seems to disappear, but otherwise expect an uneven floor. Considering this is a backpacking tent though, this should not be a problem. Black Diamond has done it again: they've created yet another tent worth your time, inspection, and (in our opinion) your money. As the lightest of their two-walled shelters, the Black Diamond Mirage tent is one of the best 2 person backpacking tents . While two drawbacks exist, only one of them is significant. Getting rain on the interior of your tent can ruin a trip. 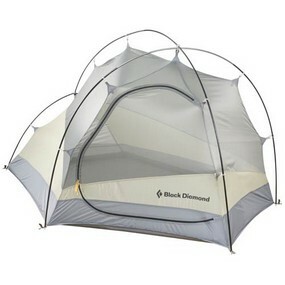 Also, due to the uneven floor and small size, the Black Diamond Mirage 2 tent is not versatile. As a backpacking tent, it rules. As a car camping tent, it's definitely not the best. Otherwise, consider the Mirage 2--you won't regret buying it. Have you used a Black Diamond Tent?